The eSense Pulse is Mindfield® Biosystems’ interesting way of entering the heart rate monitor market, but it doesn’t seem like its purpose is to compete against the other already established fitness-focused chest HR straps, instead, it looks like the manufacturer wants to further expand the biofeedback eSense ecosystem (which also includes the eSense Temperature and the eSense Skin Response). Unlike the eSense Temperature (that I reviewed some time ago) which measured the finger temperature to detect the stress level, the new eSense Pulse relies on the user’s heart rate to deliver extensive statistics and data analysis (via the dedicated app) but, similarly to the eSense Temperature, it also focuses towards improving the person’s well being by using various relaxation guides, as well as some preset measurement procedures (the app also allows the creation of personalized programmes). 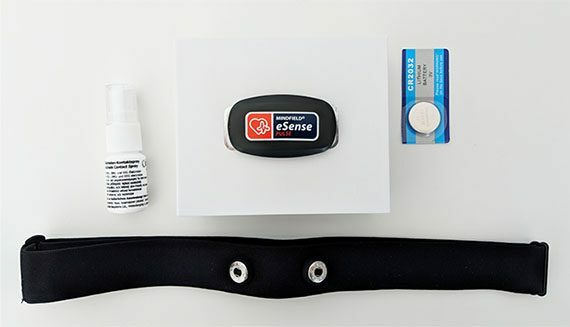 When I tested the eSense Temperature, I could immediately understand its professional use as a psychotherapy tool (it could easily be attached to a finger), but the eSense Pulse is a lot more personal, so it feels more suitable for home use (where the individual wants to add it as part of a relaxation routine), than in a psychologist’s office. That being said, the eSense Pulse does have its medical use, so let’s have a closer look at what this small device can deliver. 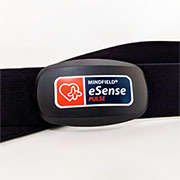 Despite not particularly focusing towards the fitness-tracking aspect, the eSense Pulse looks and feels exactly like the regular heart rate chest strap, sporting a small oval-shaped plastic case covered by a black matte finish and with the Mindfield eSense Pulse logo printed on the front side. The rear area is occupied by a circular cover which, when opened (using a counter-clockwise movement), will expose the battery compartment. 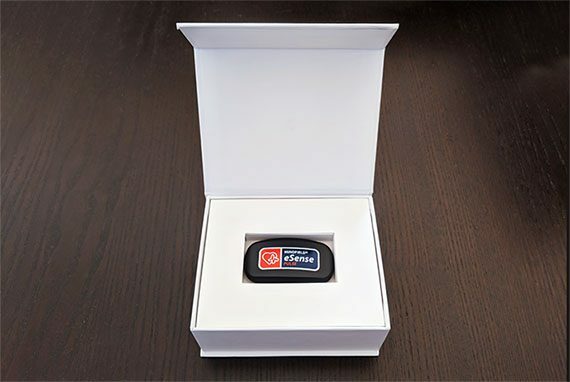 The device comes with a CR2032 battery already installed (which, as the manufacturer claims, should last for about a year – you can check the battery life using the dedicated mobile app), but inside the package, Mindfield has included an additional CR2032 battery. To the left and to the right of the battery compartment, there are two push buttons marked with L and R (left and right) that get connected to the belt. One interesting aspect of the eSense Pulse is the use of both Bluetooth (Low Energy) and ANT+ for connectivity purposes. The main differences between the two standards is that ANT+ supports multicast (can connect to multiple devices at the same time), while Bluetooth is less flexible, so, by default, only two devices can be paired using Bluetooth – the advantage of Bluetooth is that it is a lot faster than the ANT+ (BLE operates at 5GHz). By default, the eSense Pulse was made to be used with the eSense app, but you can also pair the sensor to any workout app installed on your phone which connects via Bluetooth (as a reference I used the myWorkouts Android app and everything went smoothly) or to multiple ANT+ compatible devices. If you ever used another chest strap band, well, the eSense Pulse band offers pretty much the same experience: the strap is comfortable and made of a soft material, while underneath the two connectors (to which you have to attach the sensor), there are two separate electrodes (that get in direct contact with the skin). Furthermore, the strap is adjustable and measures a maximum of about 3.3 feet, so take that into consideration if you have a wider chest – after a few uses, you should wash the strap to avoid skin irritation (obviously, after you de-attach the sensor). After extracting the sensor and the strap from the box, you need to take and adjust the band around your chest (immediately underneath the chest muscles) and then, remove it and attach the sensor to the strap by pushing the two buttons into place. Next, take the Electrode Contact Spray (included in the package) and apply a small dose on each electrode before strapping the device back underneath your chest (this way, no bridging can occur between the electrodes). 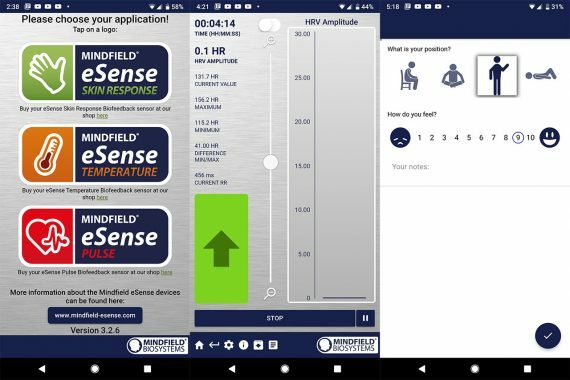 Afterwards, you need to download and install the Mindfield eSense application for either Android OS or iOS (I used the former). The user interface is pretty much the same as on the eSense Temperature, but, instead of two options, you now get three on the main page, the third being the eSense Pulse which is the area that we have to access. 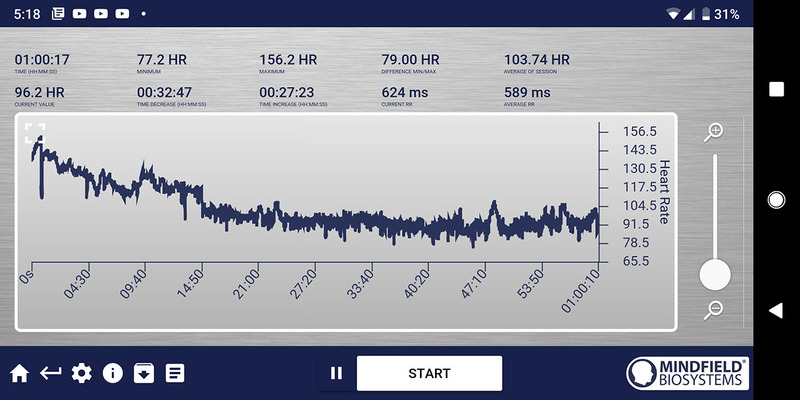 Doing so will display the familiar measurements window, where you get a live view of your heart rate divided into the elapsed Time, the HRV Amplitude (Heart Rate Variance Amplitude – which is the difference between the highest and lowest heart beat rate), the Current Value (your current heart beat rate), the Time Increase and Time Decrease, the Average Session HR, the Maximum and the Minimum HR, the Difference between the Min and Max and the Current RR (the interval between the heart beats). Depending on the screen rotation, you will either have the HRV Amplitude graphical representation on your right or on the bottom, while on the left (for the vertical alignment), there’s a larger arrow module to indicate the increase or decrease of your heart beat (it will also change colour) – next to the elapsed time, there’s a small switch which toggles between the HRV Amplitude and the Breath Pacer. 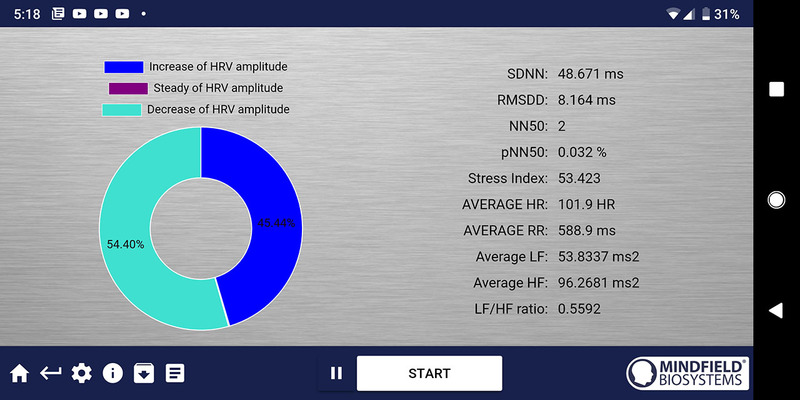 Before receiving the HRV values, you do need to pair the app with the sensor and to do so, you need to go to Settings (the cogwheel on the bottom), select Choose eSense Pulse (make sure you have Bluetooth enabled on your mobile device) and, once it gets discovered, click the check icon for the pairing to be concluded. 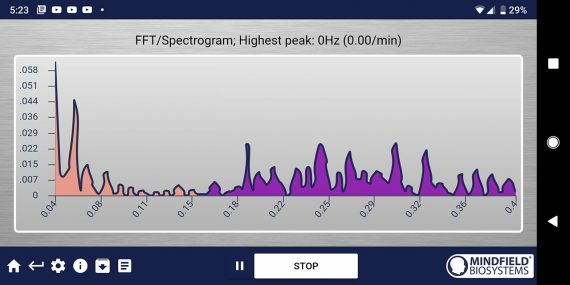 On the Settings menu, you can also change the Feedback (here, you can enable the feedback by Music, Tone, Tactile, by Smart bulb (as seen with the eSense Temperature) or enable the Breath Pacer), adjust the breath Pacer settings, set the Video, configure the Spectrogram and more. If you start a session, there are other windows besides the initial General View: slide to the left to also open the Video window (displays specific videos that you chose in the Settings area), slide again to display the Breath Pacer Graph (divided into two sections: on the left, there’s a live representation of your breathing cycle, while on the right, there’s a Coherence sphere which shows you the correlation between the heart beat and your breathing – higher means that you’re more relaxed) and lastly, there’s the FFT/Spectrogram which displays the frequency of RR intervals (the beige colour indicates the low RR, while the purple indicates the high ones). To test the eSense Pulse, I decided to take it along during one of my 1-hour cycling sessions. Towards the middle of the session, I noticed a disconcerting thing: the application froze. I restarted it and, as I arrived back home I noticed that the app froze again. I could recreate the issue by simply turning the screen off since that’s when the app would stop working (and no, it wasn’t the Bluetooth connection that timed out). The culprit seemed to be my phone, a Google Pixel 2 XL, which is one of the most up-to-date Android smartphones on the market and for this exact reason, the app wasn’t perfectly compatible. The problem immediately disappeared as soon as I switched to another phone which used a more dated Android version (v.7.0). Besides the live tracking, the eSense Pulse app also offers several training procedures: the first is the 5 Minutes Measurement which guides you through following the breath curve pacer in order to slow down your breathing (and thus, the heart rate); the second procedure is the 10 Minutes Measurement which is similar to the first program but with longer periods of time for each part of the session. There’s also the 15 Minute Measurement and the 10 Minutes Baseline, both featuring various modules to help you get an accurate heart rate variation reading and it offers some steps towards regulating it – a high variation indicates a healthy response to stressful stimuli, while a low HRV is a sign of anxiety and possibly, depression (always check with your psychiatrist to get a proper diagnosis), which can have a negative impact on your cardiovascular system in the long run. You can also create your own custom procedure by tapping on the ‘plus’ sign, where you can adjust various aspects of the chart, as well as select the new procedure name, the separator type and if there’s going to be a survey after recording. An indispensable section that you need to carefully consult is the Help area, where you can read General info about the HRV and a guide for properly installing the eSense Pulse; there’s also the Training area, where you’re guided towards creating the perfect conditions for measuring your heart rate, as well as detailed four-phase training, the first focusing towards observing, experimenting and determining the actual state, the second on the biofeedback training, the third towards provocation, relaxation and the stress management, while the fourth on transfer and relaxation. Lastly, there’s the Manuals area, where you can download the product’s documentation. At first, I wasn’t sure exactly what was Mindfield aiming when it created the eSense Pulse, but I do understand its purpose, being able to immediately show accurate heart rate readings (and other stats) plus offering a decent suite of relaxation techniques which can help you re-wire some of the bad habits that we often get in a busy and alert environment. 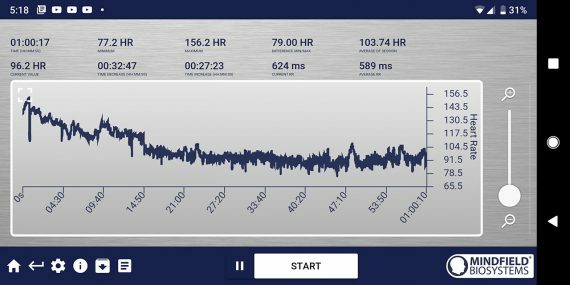 Of course, the eSense Pulse is not a substitute for either psychotherapy or medical diagnosis but it can be used as a monitoring tool for both. Furthermore, it can also be utilized alongside the other two eSense devices in order to fully take advantage of the eSense app. Note: The eSense Pulse can be connected to multiple ANT+ devices, which makes it easy to connect to additional fitness apps, so it can be a part of multiple environments.